Allison Oehrlein was an outstanding student with a laser focus on science, specifically biology. But she had all but given up hope on going to college. For the past five years she suffered with increasingly frequent debilitating migraines, until they were happening every day. She could barely get through high school, she couldn't imagine handling college classes. A parade of doctors, scans and hospital visits did nothing to alleviate the pain and ensuing side effects such as hearing impairment and stomach aches. She was eliminating activities and foods she thought might be triggering the headaches and her life was growing smaller and smaller. "My headaches were there all the time and while it wasn't this horrible severe pain, they caused these other symptoms like I couldn't hear well, I was dizzy and nauseated," Allison said. "I became so anxious but I didn't know what was wrong - I thought everyone felt this way. I didn't know what it was like not to have headaches." After years of treatment, her neurologist near their home in Chester, N.J., told Allison and her mom, Molly, there were no other treatment options. So they sought recommendations and found Dr. James Charles, a board-certified neurologist and clinical neurophysiologist at Holy Name Medical Center. Dr. Charles and Dr. Vincent Gallo, a Holy Name interventional radiologist who specializes in the treatment of migraines, work together to treat patients who haven't responded to standard migraine medication. Unrelenting migraines are caused by neurons in the brainstem secreting continuous pain messages to the brain. Dr. Charles and Dr. Gallo use medications or a procedure called a sphenopalatine ganglion (SPG), or a combination of both, to block these pain messages. Their vast experience enables them to know precisely what type of treatment and dose of medications will be successful in each patient. "Dr. Charles asked me questions no one else had asked me before," Allison said. "He was able to diagnose me so fast and I think it's because he looked at the whole picture. Each specialist looked only at their area, like when I went to an ENT specialist, he was only looking for an ENT problem. Dr. Charles looked at all my symptoms." In that first visit, Dr. Charles inquired about Allison's health as a youngster and explained that migraines manifest as stomach pains in young children. He also noted that there can be a genetic component to migraines and that Molly and Allison's sister suffer with the condition, though their headaches respond to medications. Allison was in such bad shape that Dr. Charles recommended hospitalization for treatment. "We live in Chester, New Jersey, so we stopped our lives, got a hotel room near Holy Name and stayed with Allison for the week," Molly said. "And from the second we walked into Holy Name, the staff was just wonderful to our family. Everyone was always on the ball and got us whatever we needed." After two days of treatment, Allison woke up without a headache. She told her mother she couldn't believe how differently she felt and marveled that other people wake up this way every day. Two months after being hospitalized, Allison still takes a number of medications and returns to Holy Name for periodic follow-up treatment but her headaches have diminished both in severity and frequency. She now gets them only once or twice a week, compared to 30 days a month, and more importantly, medication is effective in making them disappear. "For the past two years, I couldn't be in the same room while someone was doing the dishes because the noise made my head hurt so bad," Allison said. "And I never had the energy to do much. But I just went to graduation practice, out to lunch with friends and the mall, all in the same day. 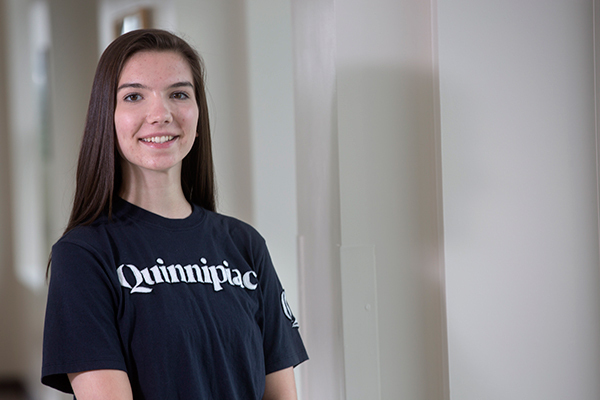 "And I'm so excited because I got a scholarship and accepted into a 4-year program at Quinnipiac, where I'll earn my bachelor's and master's degrees," Allison said. "It's a new experience and it might be hard, but I'm going to college!"